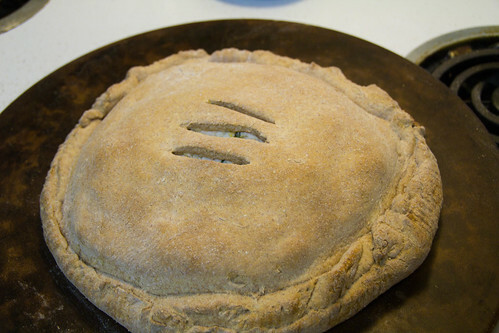 I made chicken pot pie quite often a million years ago. We got these beautiful, oven-safe bowls for our wedding, and I was super excited to make individual servings for everyone. They were so delicious, and fun to make, and easy! 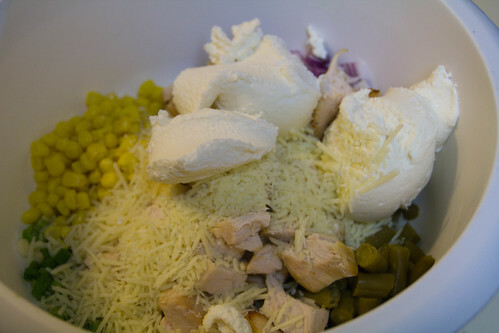 I would just put a ready made pie crust into each bowl, fill it with stuff, and then fold the dough over to seal it up. And then came that dark day. The day that I turned over one of those boxes of ready made pie crust and actually read the nutrition information. My jaw hit the ground so hard I’m honestly surprised I have teeth. 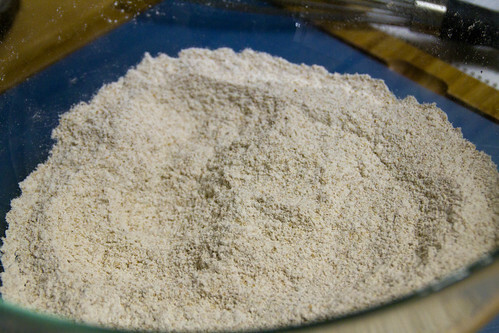 I’d never made pie crust on my own before, so I had no idea they consist of butter and flour. My mind swam as I thought of those 800 calories of crust plus everything else that went into said crust! We’d always joked about how filling they were, but it was never a problem to put two-thirds of it away in a single sitting. I cried a little as I put the boxed pie crust back in the store refrigerator. I love chicken pot pie! I’d started making them at home after I saw how full of sodium the Marie Calendar’s versions were. And the individual bowls were so fun and creative! Later I attempted to make my own pie crusts, but all the recipes I found were equally unhealthy, and many contained shortening, which I just can’t do. 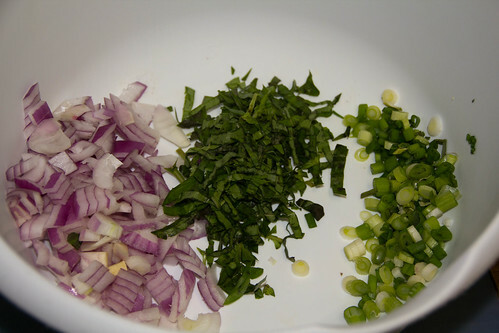 Even vegetable shortening. I know that shortening is a perfectly acceptable ingredient, but something about it just gives me a mental block. If I don’t know it’s in there, please don’t tell me. 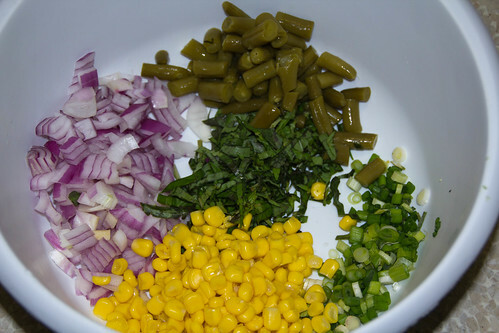 Mix only until combined! Try really hard not to overwork the dough. 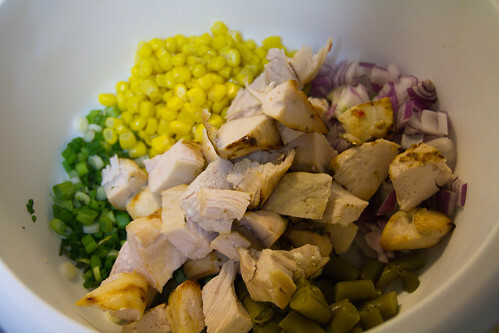 In a separate bowl, combine filling ingredients and give them a good stir. Next, flour a rolling surface and rolling pin. And I mean flour baby. 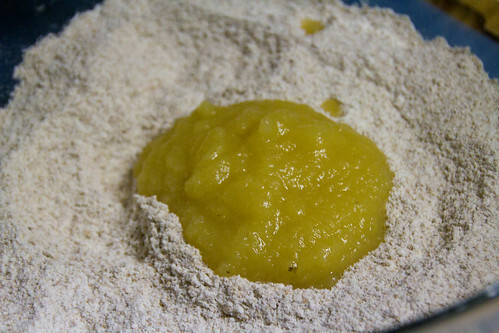 This dough starts out sticky. 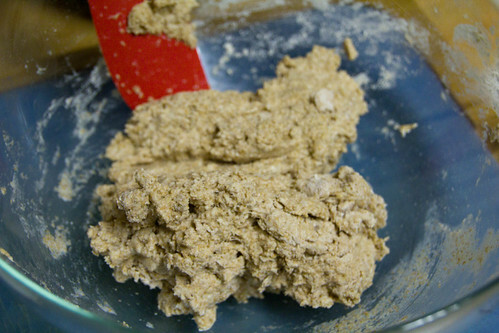 Place half of the dough onto the floured surface. 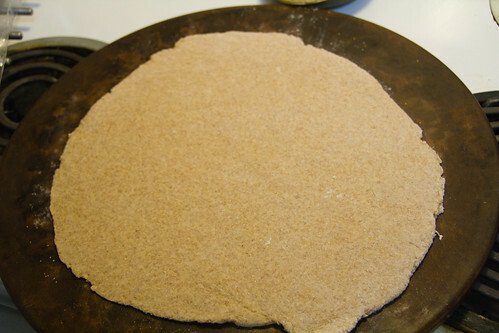 Roll the dough into a roughly circular shape and carefully move it onto a pan. I prefer stoneware, but use what you’ve got. 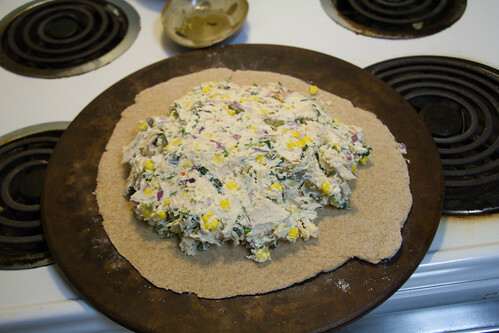 Spread the filling over the dough, leaving some space on the edges. 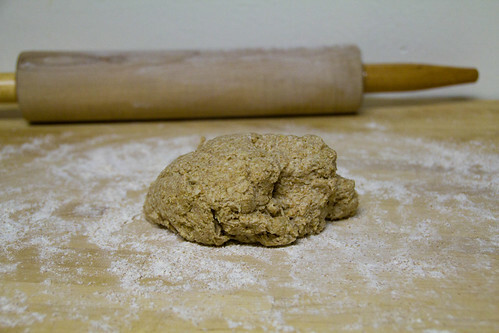 Then repeat the rolling process with the other half of the dough. 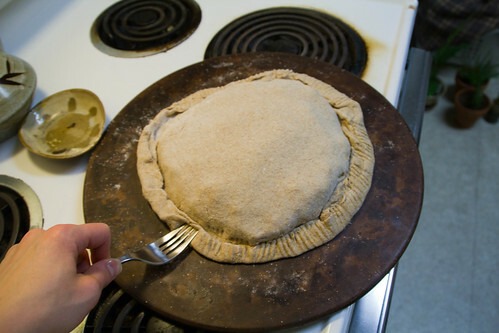 Gently drape the top crust over the filling. 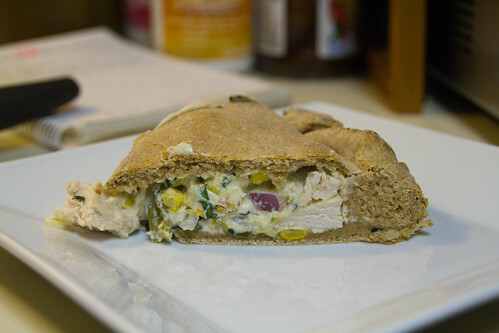 Roll the bottom crust over the top crust, and then press with a fork for good measure. You don’t want this popping open during baking. Then cut a few slits to let the steam escape. If you’re artistic, you could do something really pretty here. I’ve known from a very early age that all my artistry is in my feet. No big deal. 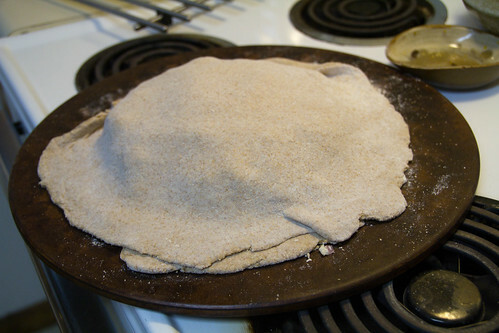 I used a pastry brush to remove the excess flour that gets on the crust during rolling. 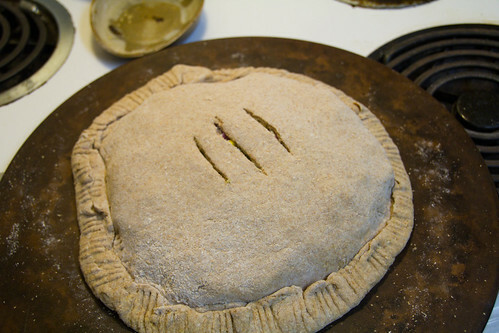 It never occurred to me to then brush the crust with butter or an egg wash, and really, I don’t think it needs it. However, if you want to try it, let me know how it goes. It might make it that much prettier. This took about 15 minutes to bake the biscuit crust all the way through, and if I would have spread the filling out just a tiny bit more, it would have been hotter in the middle (it was definitely warm, but there was no steam going on). Whatever! It tasted so good! I paired it with a giant salad, and we had an excellent meal. I’ll leave you with the final shots.